At the Children Eye Care center in Sadguru Netra Chikitsalaya, we not only offer complete eye exams for children but we diagnose and treat complex eye disorders in children through medical treatment plans and surgical options. We are frontrunners in our field in treating pediatric eye conditions and our set-up is the first in its kind in the region of central and north India. Adults with strabismus who desire strabismus or eye muscle surgery to cure eye movement disorders are also seen and treated here. We also deal with the Low Vision patients and treat them accordingly. 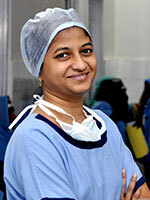 Paediatric ophthalmology is unique amongst the sub-specialties of ophthalmology with its boundaries defined primarily by the age of the patient rather than by groups of clinical conditions that it treats. As almost all the subspecialties are managed by Pediatric ophthalmologists, they require very special training. With expert consultants in Pediatric Ophthalmology unit of Sadguru Netra Chikitsalaya, we aim to train the candidates in wholesome manner to a confident and compassionate Pediatric ophthalmologist. 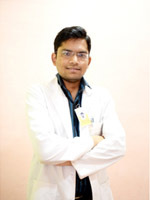 Designation Head of Department of Pediatric & Strabismus Surgery. With her communication and interpersonal skills, coupled with her vast clinical and surgical expertise, Dr. Pradhnya is a perfect Pediatric ophthalmologist. An active promoter of safe child-rearing, she has made interactive presentations for the cause. This is especially worthwhile in the rural set-ups where the traumatic cases in children are extremely common. Designation Trustee - Administrator of SNC and Senior Consultant of Pediatric Ophthalmology. 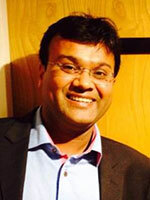 He is into research and has presented research papers in various national and international conferences and journals. 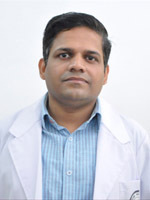 Dr. Elesh Jain manages all the clinical and non-clinical operations management of SNC ensuring the highest-quality eye-care services for otherwise unprivileged masses. At what age my child can have refractive error? Refractive error can present at any age since birth, so screening of every child is important. Screening should be done at birth and continue as a part of routine checkup. How I can know my child has refractive error? Most of time refractive error is asymptomatic. Child may have symptoms like watching television closely, difficultyin seeing blackboard, copying letters in notebook etc. Are there any options other than spectacles to correct refractive error in children? At present, spectacles is the most acceptable way of correction of refractive error in children. Other options are contact lenses and refractive surgeries. Will young kid wear spectacles? Yes, even young kids will wear spectacles happily if the vision improves. How long my child has to wear spectacles? May be life long, but in refractive errors like hypermetropia the spectacles may be weaned with time. What are the symptoms of cataract in children? Most common symptom is a white reflex in the eye. Other symptoms are failure to notice toys and faces, difficulty seeing blackboard at school, deviation of eyes or wandering eyes. 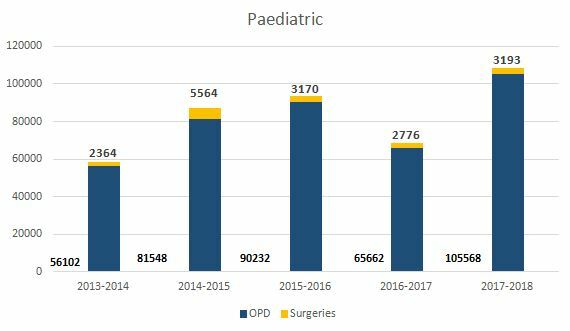 Is surgery the only treatment option for paediatric cataract? Yes, visually significant cataract needs surgical intervention. No medicine can cure cataract. Can the surgery be delayed till the child grows? No, delaying the surgery will hamper the visual outcome. Earlier the surgery, better the visual prognosis. Is the intra ocular lens (IOL) safe for child’s eye? Yes, IOL is safe in child’s eye; moreover same IOL will work lifelong. Will my child require glasses even after IOL implantation? Yes, the child needs to use glasses for residual refractive error. Also frequent follow up is advised for changing refraction, amblyopia management ( if present ) and development of glaucoma. If my one child is affected by cataract is there any chance of other sibling to get affected? It depends on the cause of cataract if cause is genetic (8-10 %of pediatric cataract is of genetic origin) then it can affect other siblings. so screening of other siblings is important. When to consult the ophthalmologist if my child has deviated eyes? As early as possible as untreated cases can lead to amblyopia( lazy eye) and loss of binocular single vision Also in some cases squint may be a presenting complaint of life threatening problems such as retinoblastoma. Can squint lead to decreased vision? Yes, definitely it can. Because the brain has a tendency to neglect the less commonly used squinting eye which can cause the eye to become lazy (amblyopia). Do all patients with squint need surgery? Not necessarily. Treatment depends on the type of squint and may include spectacles, prisms, patching, surgery or any combination of these. Can I wait for squint surgery till my child grows older? Ideally squint surgery if necessary should be performed as early as possible. If left untreated it may lead to reduced vision in squinting eye and also will not have binocular single vision. Binocular single vision helps your child to see the world in three dimensions (3D). Can surgical correction for a squint also correct a lazy eye? Surgical correction for a squint is used to straighten your child's eye so that both eyes look in the same direction. If your child has developed a lazy eye as a result of his or her squint, surgery alone will not improve vision. 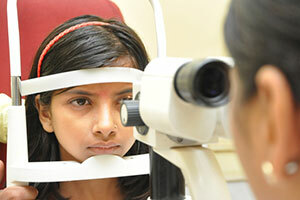 Your child will need additional treatment in the form of patching of sound eye. The Chances of vision improvement decreases as theage increases. Amblyopia is generally the result of poor early visual development, and as such, usually occurs before the age of eight. Presence of strabismus (crossed-eyes), unequal refractive error (farsightedness or nearsightedness), or a physical obstruction of vision (cataract, ptosis etc) can lead to amblyopia due to decrease in vision in one or both eyes. Premature and low birth weight babies are more prone to develop amblyopia. Yes, amblyopia is treatable. The earlier the treatment, the better the opportunity to reverse the vision loss. Treatment involves correcting the refractive error with use of glasses and/or contact lenses, correction of squint, removal of cataract. Covering or occluding the better eye, either part-time or full-time, may be used to stimulate vision in the amblyopic eye. If not treated early, an amblyopic eye may never regain good vision and it can limit the occupation and activities requiring good depth perception. How can I suspect glaucoma in my child? If your child has constant watering, intolerance to light, large size eyeball he / she may have congenital glaucoma. If family history of glaucoma is present, child should be screened earlier. Is there any other treatment option than surgery available for congenital glaucoma? In congenital Glaucoma surgical treatment is necessary to keep the IOP under control. Medicines can only be used to buy time for surgery. Will surgery restore the lost vision in childhood glaucoma? No, the surgery will only prevent further decrease in vision and field loss but no procedure or drugs can restore the already lost vision or fields. Also it will not decrease size of already enlarged eye ball. Will my child need medicines after surgery of glaucoma? To keep the IOP under control some patients may need drops even after surgery. When eye injuries can occur in children? Pediatric eye trauma most often occurs during play, or at school. Eye and face protection is essential to prevent these injuries. Children should be monitored while playing. What should be done when a child gets an eye injury? A child that sustains an eye injury should seek immediate medical attention from an ophthalmologist to assess the vision function. Frequent examinations until the eye is completely healed are often necessary.